If your SEO agency gets you fantastic amounts of traffic and visibility, that’s great right? Well, if people are soon leaving your page and not sticking around, all of those results can go to waste. In SEO, this is known as a bounce rate. If people don’t stick around, they often ‘bounce’ off, typically landing somewhere else. This can often harm your end goal, such as conversions or sales. Where can you find out about your bounce rate? This is easy – it’s in Google Search Console. According to a study by RocketFuel, the typical bounce rate is between 26% and 70%, with an average of 49%. Of course, a lower rate is good, so how can you make this happen? 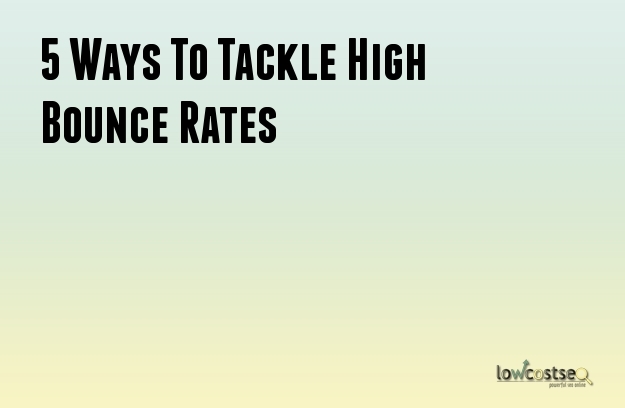 Here are 5 possible problems or methods of tackling high bounce rates on your websites. Bounce rates, like much search data, can be given for your overall website, as well as each page. Because of this, if you notice a drop in your bounce rate, you should check every page and see where the low ones lie. It may turn out, for instance, that the page in question isn’t a relevant part of your strategy (so not as urgent, or could perhaps be deleted, redirected via 301 etc). On the other hand, you may find one particular page is causing problems, so you know where to apply your focus. People hate waiting for pages to load. It’s why AMP is widely used on mobile pages and it’s also why people click off of pages very quickly. In fact, Google uses load times it as part of the algorithm behind its search engine. Is the user motivated to do anything on your page? Some pages offer little value (and you should question if you need them and should certainly consider stopping them from being crawled) and this is one of the reasons why people leave. When you’re in Google search console, look at the average session length. Are people staying for 10 seconds, or 50? If they’re staying longer, this suggests they are at least looking at the page, but find the content doesn’t keep them. If this is the case, consider expanding the content, adding more appealing factors, such as visual elements, or even some sort of interactive element. A survey, quiz or comment box would, for example, give people a reason to stay, if such an inclusion made sense for that given page. If a page ranks for queries it doesn’t answer, this can also result in a high bounce rate. If this is the case, look at what keywords your pages are being found through (tools such as Ahrefs are good for this) and determine whether your page is honestly addressing these needs. Users can tell quite quickly, through the headline and opening text, whether this is the case or not. This can also happen if people come via other sources, such as linked content. If the linking text is taken out of context, it’s understandable people will be confused and disappointed. This is most common when you notice a rather sharp spike in bounces when the link is published. Finally, it is always possible that your pages are fine. If you forget to implement Google’s web tracking codes for search console, this can often result in incorrect figures. It’s not unheard of for this to happen when new pages are added, for instance. Fortunately, Google has its own guide on how do implement this code.